This weekend I will walk across the stage to receive my diploma for completion of my Bachelor’s degree in Computer Science from Carnegie Mellon University. In light of this, I thought I’d take some time to share my experiences, to give a taste of what the past three years of my life have looked like, for anyone who may be interested. The campus is great. This was actually a major factor in my college decision making process. The campus is small, self contained, super well maintained, and beautiful. Of course, I benefitted from the fact that the CS buildings are some of the nicest on campus, but it really does apply to the campus as a whole. I loved the fact that I could just about walk between any two of my classes without having to be outside for more than 30 seconds, max. This was especially useful during Pittsburgh winters. It is stressful. These past three years have, by far, been the most stressful years of my life, though I haven’t lived many years. Many people will say that CMU has a “stress culture.” I don’t know if I agree with that; maybe it was true once, but in my experience, I’ve never met anyone who encouraged others to be stressed out. It’s not an accomplishment to pull an all-nighter, even though they definitely happen. Instead, what I will say is CMU teaches you how to deal with the stress. Or at least, it taught me. Though I’m proud to say that I made it without ever pulling an all-nighter (for school work), and fairly consistently getting 7+ hours of sleep per night. That said, I didn’t have much of a life outside school. I’ve taken so many interesting classes at CMU. I’ve invented a languge, I’ve written an operating system from scratch, and I’ve built super cool robots. To avoid going on for too long, I’ve chosen a few particularly interesting/difficult courses that I feel are representative of the coursework here at CMU. This was my very first CS class at CMU. I took it with Tom Cortina, who is an absolutely wonderful professor and human in general. This class is basically an intro to “C” (In quotes because most of the class is taught with a safer derivative of C called C0) with the very Carnegie Mellon-twist of focusing on proving correctness of programs. The class introduces the concepts of preconditions, postconditions, loop invariants, and basic data structures like stacks and queues. It’s probably equivalent to most colleges’ intro CS courses, but with a greater focus on correctness and proofs. I ended up TAing this course for a year which was a lot of fun. HERE WE GO. This is that course. The hard course. The one where exam averages are in the 50s and no one except that one kid that sits in the front actually knows what the hell is going on. I took this class with Ada and O’Donnell (also really great professors). The bulk of this course is CS theory: Turing machines, finite automata, graph theory, etc. It doesn’t go too deep into any one topic, but given that most of the people in the class have no experience with any of it it feels like being thrown into the deep end. The problem sets consistently took 12+ hours a week. It sucked. Coincidentally, this class is also how I met the person who would become my roommate for the next 2 years. The shared misery brought us closer together. This is widely touted as one of the most difficult CS courses at CMU. It is one of several that fulfills the Systems Elective requirement of the curriculum, so many people don’t take it. I couldn’t resist, however, and I regret nothing. The semester I took it, the course was taught by Dave Eckhardt and Dave O’Halleron. This course is composed of roughly 4 major projects, the largest of which being the design and development of a multi-threaded Unix-like operating system from scratch. I think I learned more in thise course than I did in any other CS course at CMU. The biggest takeaway for me was that nothing is magic under the hood of operating systems. I won’t claim to know how everything works, but I have a much better understanding of how it could work, because I did it. Another great benefit of taking this course is that my debugging skills are easily 10x better than they would have been without it. For anyone at CMU reading this and trying to decide if they should take this course, you should. It will make you a better programmer. Most of the difficulty of this class comes from the short deadlines caused by the extreme breadth of the course. It is a time consuming and very frustrating class but not a particularly intellectually stimulating one. That said, the TAs do an excellent job at making the course a little bit less miserable and are perhaps the course’s single redeeming quality. Playing with Lego is also fun, but not for 15 hours a week. One of my main reasons for attending CMU in the first place was because it boasted a high number of undergraduates involved in cutting edge research, and I wanted to be a part of that. Just a couple of weeks into my freshman year, I started reaching out to professors about potentially working in their labs. I was lucky enough to get a response from Red Whittaker who is famous for many things, such as leading the CMU team to victory in the DARPA Urban Challenge. When I met Red, he invited me to participate in the Planetary Robotics Lab, which was working on an extremely small lunar rover in pursuit of the Google Lunar XPrize. During my three years working with Red, I went from a novice just trying to wrap my head around all the work being done to leading the Avionics/Software team on three iterations of the rover. This was perhaps my most rewarding experience at CMU. I learned so much, and now, when some iteration of the rover lands on the moon in a few years time, I can say that I was a part of it, which I think is pretty cool. Below is a video showcasing Tetramorph, the first rover I worked on. It’s not shown in the video, but it can actually fold up and fit inside a 30cm cube and then deploy itself to the form shown in the video. Something else that is unique at CMU (at least based on what I’ve heard about other universities) is that students make up the majority of the course staff for core courses. I was a Teaching Assistant for Principles of Imperative Computation for two semesters, along with about 15 of my peers. As a TA, I held regular office hours and lead recitations along with hands-on labs. This was super rewarding for a multitude of reasons. I had the opportunity to make a serious impact on others’ experience at CMU. I would often have students come in to office hours frustrated by a bug they’ve been working on for hours or not quite grasping a lecture concept, and I got to help them work through it until it clicked. That alone is an awesome feeling. I was able to encourage them and help them deal with the stress, and I’d like to think that I was able to significantly improve at least once person’s experience in the course. I got an inside look into how a typical course is run, and what the hiccups or difficulties are. This made me appreciate all the courses and teachers I’ve had in my life because now I know that grading, and teaching in general, isn’t as easy as I thought. You don’t really understand something until you have to teach it. When I took the class, I passed with an A, but I learned so much more from teaching than I did from taking the course. Being the first class on data sturctures and algorithms, increasing my mastery of those topics will definitely help me in the long run. FOCUS is the Fellowship of Catholic University Students. I’ve been Catholic my whole life and immediately sought other like-minded students on campus. What I found were 4 dedicated missionaries who invited me to join bible studies, participate in discipleship, and just hang out with other Catholic students at Carnegie Mellon. I think without this connection, I could have had a rough time not just in my faith life, but in my every day life. The Catholic community at CMU provided a solid group of friends and a sense of community that I don’t think I would have had otherwise. One thing I didn’t really expect going into CMU was the extent to which major companies recruit on campus. The moment that sticks out the most to me was during finals week my freshman fall when Microsoft hired professional masseuses to give free massages to CS students. This is an extreme example, but almost every other week there is some company set up in the CS building offering T-shirts or cookies or coffee, or other random swag in exchange for resumes or conversation with a recruiter. After my freshman year, I applied to several companies including some bigger ones (Google, Microsoft) and some smaller random startups, but didn’t get any offers (I got interviews for about half). After my sophomore year, I applied to fewer companies, but got an offer from every company that gave me an interview: Google, JPL, and Narrative Science. I ended up accepting JPLs offer and spent the summer working on path planning algorithms for the Mars 2020 mission. I never painted The Fence. The Fence is a tradition at Carnegie Mellon. In the heart of campus, The Fence has been painted hundreds of times by the students. On campus organizations “take the fence” to promote upcoming events or just for fun, completely covering the structure in a layer of paint between the hours of midnight and 6am. Unfortunately, this was a tradition that I never got to be a part of. I never participated in Buggy/Booth. Carnival is pretty much the only “party weekend” for CMU. THe weekend is filled with fun including Buggy, in which teams race their aerodynamic vehicles at high speeds around campus, and Booth, in which campus orgnanizations build large, often multistory structures for viewers to walk through and admire. It’s a fun weekend, but participating in either event is a huge time commitemnt and my time was precious. All in all, most of these come down to me not wanting to give up my time. I’d urge those who come after me to be less of a Scrooge and have a little fun. You’ll regret it if you don’t. I graduated from CMU in 3 years and acquired about $90,000 in student loan debt. I accepted a job at ASV Global where I’ll be working as a software developer for their autonomous boats. I ended up with ASV for a variety of reasons, not least of which being that they have an office back in my home town of Lafayette, Louisiana. I’ve been wanting to go home for a while now to be around family, and the cost of living is also much, much lower compared to Silicon Valley. The downside is, of course, my salary is lower compared to what I’d be getting in Silicon Valley, but that’s a small price to pay for the comfort of being at home. All in all, I’ve enjoyed my time at Carnegie Mellon. I hope this has given some insight into what life is like there for prospective students or others. With this chapter of my life closed out, I look forward to the many adventures that lie ahead, knowing that Carnegie Mellon has prepared me well. I’ve never really been one for New Year’s resolutions. Part of it is probably that I’ve always been fairly comfortable and complacent with my life that making any drastic changes has seemed entirely too inconvenient. As you’ve probably surmised from the title, I’ve had a change of heart. My hope is that by writing them down, even if no one else reads them, I might feel a tiny bit more obligated to stick to them. Hopefully, in 365 days I’ll have a new post to say that I actually completed them all. I’ve had this blog for quite a while now (3+ years) and I have 6 posts, including this one. That’s pretty pathetic. I think writing or at least keeping some sort or journal is a fairly productive thing to do. Especially with respect to technical aspects, I think writing about projects helps to review your work and think about ways you could have done things better or differently. Assuming someone reads what you write, it also provides a means of receiving feedback which is invaluable. I think the most important consequence of writing about projects is that it forces you to justify your decisions. The more detail you include, the more you have to rationalize each decision you made. I hypothesize that this will make me a more deliberate, careful developer since if I make bad decisions I’ll then have to tell the entire internet about how I made terrible design choices. Every two months or so for the past several years, I get an overwhelming desire to develop a video game. This typically results in me coming up with a half-baked idea, spending an inordinate amount of time to come up with a clever name, spend about a week tops coding up a prototype without finishing and then abandoning the project altogether. My goal for 2017 is that I actually follow through on one of these projects and “finish” it. Besides just developing a game, I want to maintain a devblog, promote the game on social media, and do all the things a typical indie developer would do. I don’t plan to go into gamedev full-time any time soon, but I think there are a lot of skills that I can learn from hobby gamedev that will help me in other aspects of my career. The gamedev bug has bitten me again so I’ve currently got something in the works; with any luck, the first entry of my devblog for that project will be out this week. I’d also love any fiction suggestions to throw into the mix. I’ve read and loved the entire “Hitchhiker’s Guide” series by Douglas Adams. 2017 will be the first year in which I’m not a student, seeing as I’m graduating in May (woohoo!). A consequence of this is that I’ll no longer be held accountable by others (e.g. religious educators, FOCUS missionaries) with respect to my faith. It will be completely up to me to nurture and increase it. My goal for 2017 is to accomplish this. The exact method isn’t clear, but I know I want to grow closer to Christ and He wants to grow closer to me. So that’s it. My four resolutions for 2017. Feel free to hold me accountable on Twitter (@ganashaw). Hopefully, I’ll be back in a couple days with a devblog for my latest project. I just recently finished developing an adaptation of the classic “Lights Out” game. 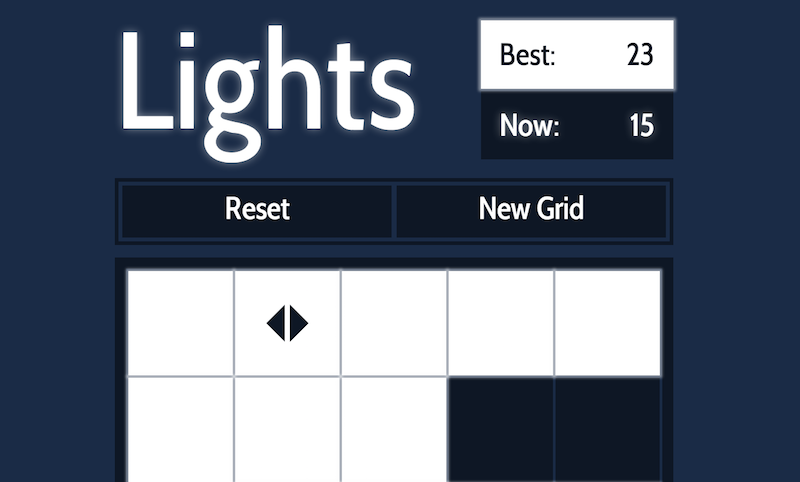 For those of you who aren’t familiar, the object of the game is to turn on all the lights on the grid. Whenever you toggle a light, all 4 adjacent lights would also be toggled. In my version of the game, Lights, the same rules and objective apply. However, some lights are “directed” meaning when you toggle them, only the adjacent light(s) in certain direction(s) are toggled, which increases the difficulty of the game. The game itself has some fairly interesting nuances to it. Firstly, the order in which you toggle lights doesn’t matter. Assuming you start with a board configuration A, if you toggle light 1 and then light 2, this is equivalent to toggling light 2 and then light 1. Also, somewhat obviously, tapping on the same light twice (or any even number of times) is the same as not tapping it at all. Likewise, tapping a light an odd number of times is the same as tapping it only once. What this mean is every solvable board can be solved by tapping a subset of lights only once. Pretty nifty. I have a really bad habit of over-engineering my code. I actually started this project last May, but I didn’t get very far. I started looking at the code again about a week ago and was pretty overwhelmed. It consisted of about five different classes that did somewhat obscure things in very obscure ways. I started by pruning away almost all of the existing code, and began working in a single file. Surprisingly, this made my code more readable than when it was split up between classes. It was easy to follow the code which greatly aided debugging. I think that having everything in one place will also make it easier to maintain (to a point). I’ve always had a thing about making my code “look good” and to me, long files always failed to achieve this. However, I’m starting to see the beauty of consolidating code and replacing lots of little classes with lots of little functions. As far as the design of the game, I’m actually pretty happy with it. One aspect that I didn’t like was the fact that I couldn’t find a way to add multi-directional arrows without cluttering the design. If you play it, you’ll notice that arrows are always either up/down or left/right. Never both. There’s nothing difficult about this from a programming standpoint, but I absolutely could not find a way to elegantly add it to the design. I’m not too upset about this, but I never really like when form gets in the way of function. Perhaps a better designer than I could come up with a solution. What happened to the expiration dates?! Your guess is as good as mine. What made cookies really annoying is that there doesn’t appear to be a way to test cookies using the file:/// protocol, which makes local development very difficult. (As an aside, Google Chrome supposedly has a flag to enable file cookies, but I couldn’t get it to work). I think the biggest thing I gained from Lights was finally finishing a project and releasing it to the public. I don’t think I’ve ever done it before and it’s a really good feeling to finish something and be satisfied with it. I would deeply appreciate any feedback you may have, you can contact me on Github or via email. At the moment, my best score is 31. Can you beat me?